Dole has had many partnerships with films to help encourage families to eat healthier, as well as use pop culture to inspire exciting new recipes using Dole products. Last year, they made some fantastic Dole recipes pulling inspiration from Beauty and the Beast, Cars 3, and Star Wars: The Last Jedi. •HEAT grill to high heat. •Slice bananas diagonally. Sprinkle with cinnamon and grill, for 3 minutes on each side. 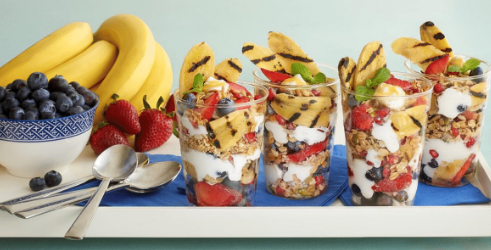 •LAYER banana, yogurt, strawberries, blueberries, granola, honey, pomegranate seeds and mint leaves in parfait glasses. •HEAT olive oil and garlic in large skillet. Add spinach; cook 2 minutes or until it wilts. Remove from heat; stir in DOLE broccoli, set aside. •COMBINE shredded cheese, pumpkin puree, ricotta cheese, and egg white; set aside. •LAY tortillas on counter. Arrange spinach and broccoli in center of tortilla. Spoon on 1 tablespoon cheese-pumpkin mixture and sprinkle with seeds. Fold in sides and roll into tiny burrito shapes. You can freeze the snack pocket at this point or arrange on baking sheet. •BAKE 10 minutes or until cheese melts and is heated through. A Ratatouille Dining Experience Available During Pixar Fest!